There may have been more written and said about this election than any in our history. Many of us believe that the stakes have never been higher for determining the direction, and ultimate definition, of what America will be in the future. While there are many extremely important issues on the line, i.e. Supreme Court nominations; terrorism/national security; jobs and the economy; health care, etc., there is one issue that is exponentially more important to determining if America continues to be the “beacon of freedom” and “land of opportunity” that we have always been or if America is to be transformed into a European styled, socialist-lite, shell of what our Founders created. We must use this election to take back our country and government from America’s elitist, ruling class: Career Politicians. America has NEVER needed or wanted an aristocracy. George Washington refusing a lifetime appointment as President perfectly exemplifies that point. 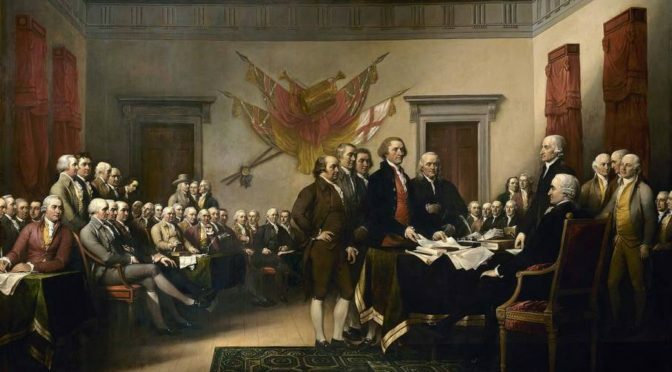 Our Founders rebelled and fought a war for American independence against an oppressive aristocracy. Our Founders created our form of government with the idea that being elected as a representative or a senator was a PART-TIME job. They were to return home at the end of session and rejoin the communities from which they were elected. They were expected to listen to the values, needs and concerns of the citizens they were chosen to represent. More importantly, they were expected to carry those back to Washington, DC and actually STAND UP FOR same citizens and the issues they hold as important. Somewhere in the last 240 years that process has gone terribly awry. Today we have an elite political class of career politicians that do not listen to, believe that they are smarter than and, thereby, know what’s best for the everyday Americans that elected them. This ruling class, which is composed of BOTH parties, like every other aristocracy, does not fear, or worse, does not respect the common person they “rule.” They routinely betray their core values and those of those they represent in favor of committee chairmanships, donations (re: money), etc. Our “ruling class” sees our Constitution as an antiquated hindrance to America becoming what THEY feel it should be. These people are attempting to remove the most precious freedom that we have in America: the ability for each of us to CHOOSE what is best for US. In full disclosure, Donald Trump was not my first choice. He is absolutely NOT a perfect candidate, not a “true conservative”, etc. I know all of the adjectives associated with demeaning and criticize him; however, if you agree with most, much or any of what I have stated, there is no other choice. If you understand my point, and are as tired of being maligned, ignored, placated and, frankly, lied to as a “regular” American as I am, you have no other choice. This election is NOT about Donald Trump, it is BIGGER than him. He has become the focal point and standard bearer of the ire of millions of Americans who are fed up being controlled and dictated to by a ruling class that we should never have. I have purported for over 25 years that the day would come where we are so fed up with career politicians that a candidate would emerge that would truly resonate with Americans of both political parties. I described that person this way: not a member or either party; right of center because as a country we align more towards conservative principles; independently wealthy because they will receive no support from either party; and, most importantly, this person will be perceived truly loving this country and as giving straight, honest answers, like it or hate it, to straight questions. Hillary Clinton is none of, other than wealthy, nor is she perceived to be any of, what I described. She is the epitome of the elite, ruling class career politician who will continue to take America towards where it was never founded to be. It comes down to this: we have an opportunity to wrest control from these elite, arrogant career politicians, upend the status quo, insert fresh, untainted political blood into our system and take back our government and country from our unwanted political aristocracy. Donald Trump is not without faults; however, in my lifetime he is the closest to the candidate I described. Like him or hate him, he represents, quite possibly, the last opportunity for “regular” Americans to exert control over and take back our government to put America back on the path set by our Founders. It is time for WE THE PEOPLE to remove our elitist political aristocracy and take back control of our own destiny. Next Next post: WHO GETS TO DECIDE?